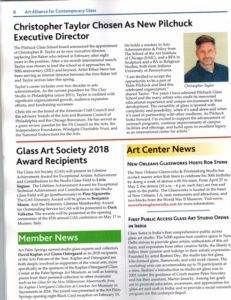 The New Orleans Glassworks & Printing Studio has invited master artist Rob Stern to celebrate his 50th birthday by doing a week of demos with his team. From April 27 to May 2, the demos (10am – 4pm each day) are free and open to the public. The Glassworks is located in the heart of New Orleans, LA, near restaurants and attractions, and two blocks from the World War II Museum. Visit www.neworleansglassworks.com for more information.